Mike Barrett is Director of Glasgow Polyomics and a Professor in Biochemical Parasitology in the Institute of Infection, Inflammation and Immunity at the College of Medical, Veterinary and Life Sciences. He is also a member of the Wellcome Trust Centre for Molecular Parasitology in Glasgow. Mike obtained his PhD from the University of Cambridge (UK) in 1990 and completed postdoctoral fellowships in Cambridge, Bordeaux (France) and the London School of Hygiene and Tropical Medicine before joining the University of Glasgow in 1994. Mike’s personal research interests revolve around how drugs work against parasitic protozoa and how resistance to drugs occurs. 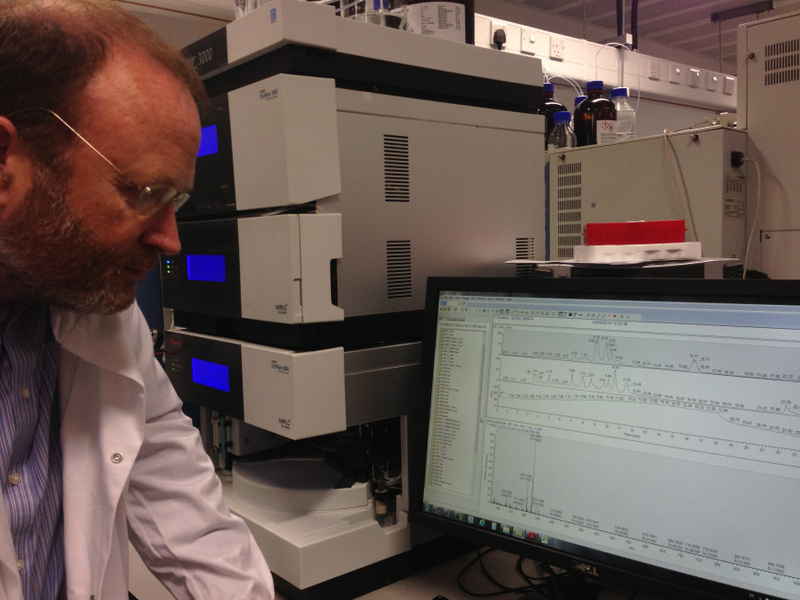 It was as part of his programme to address such questions that, in 2009, he founded the Scottish Metabolomics facility with a grant from the Scottish Universities Life Sciences Alliance (SULSA). That facility subsequently became a key part of Glasgow Polyomics, which was launched in 2011 with investment from the University of Glasgow and the Wellcome Trust. Polyomics approaches to understanding the biochemical physiology of parasites is central to Mike’s current research programme, and research in this area is being turned towards the development of new drugs and diagnostic tools. He currently holds grants from the Medical Research Council, BBSRC, EPRSRC and European Commission to pursue different aspects of these research interests. Mike is Chairman of the Kinetoplastids Drug Efficacy working group at the World Health Organisation; a member of the WHO’s expert committee into human African trypanosomiasis and also of the WHO Special Programme for Research and Training in Tropical Diseases (TDR) reference group on Chagas disease, human African trypanosomiasis and leishmaniasis (DRG3). He is on the Scientific Advisory Boards of the Scottish charity “Developing World Health”, the French “Parafrap” Laboratories of Excellence Parasitology Research programme, and the Swiss Sinergia ("Transporters of Trypanosoma brucei: Physiology, Pharmacology") project. He is deputy director of SULSA, where he is also the director of the Systems and Synthetic Biology theme. He sits on the editorial board of Molecular and Biochemical Parasitology and the International Journal of Parasitology: Drugs and Drug Resistance. Follow Mike's musings on his Blog and at the New Statesman. Alkhaldi, A.A.M., Creek, D.J., Ibrahim, H., Kim, D.-H., Quashie, N.B., Burgess, K.E., Changtam, C., Barrett, M.P., Suksamrarn, A., and De Koning, H.P. (2015) Potent Trypanocidal curcumin analogs bearing a monoenone linker motif act on Trypanosoma brucei by forming an adduct with Trypanothione. Molecular Pharmacology, 87(3). pp. 451-464. Shameer, S. et al. (2015) TrypanoCyc: a community-led biochemical pathways database for Trypanosoma brucei. Nucleic Acids Research, 43(D1). D637-D644. Achcar, F., Kerkhoven, E. J., and Barrett, M. P. (2014) Trypanosoma brucei: meet the system. Current Opinion in Microbiology, 20. pp. 162-169. Giordani, F., Munde, M., Wilson, W. D., Ismail, M. A., Kumar, A., Boykin, D. W., and Barrett, M. P. (2014) Green fluorescent diamidines as diagnostic probes for trypanosomes. Antimicrobial Agents and Chemotherapy, 58(3). pp. 1793-1796. Barrett, M. P., and Croft, S. L. (2014) Emerging paradigms in anti-infective drug design. Parasitology, 141(1). pp. 1-7. Creek, D. J., and Barrett, M. P. (2014) Determination of antiprotozoal drug mechanisms by metabolomics approaches. Parasitology, 141(1). pp. 83-92. For more information and publications please visit my ReseachGate profile.